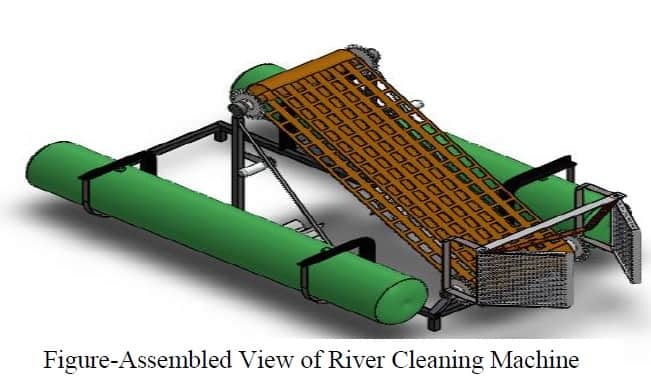 This project emphasis on design and fabrication of the river waste cleaning machine. The work has done looking at the current situation of our national rivers which are dump with crore liters of sewage and loaded with pollutants, toxic materials, debris etc. The government of India has taken charge to clean rivers and invest huge capital in many river cleaning projects like “Namami Gange”, ‘’Narmada Bachao’’ and many major and medium projects in various cities like Ahmadabad, Varanasi etc. By taking this into consideration, this machine has designed to clean river water surface. Nowadays almost all the manufacturing process is being atomized in order to deliver the products at a faster rate. Automation plays an important role in mass production. In this project we have fabricated the remote operated river cleaning machine. The main aim of the project is to reduce the man power, time consumption for cleaning the river. In this project we have automated the operation of river cleaning with help of a motor and chain drive arrangement. Some needs of automation are described below. Here using RF transmitter and receiver are to control the cleaning machine. Automation can be achieved through computers, hydraulics, pneumatics, robotics, etc., of these sources, pneumatics form an attractive medium for low cost automation. The “River cleanup machine” used in that places where there is waste debris in the water body which are to be removed. This machine is consists of waterwheel driven conveyer mechanism which collect & remove the wastage, garbage & plastic wastages from water bodies. This also reduce the difficulties which we face when collection of debris take place. A machine will lift the waste surface debris from the water bodies, this will ultimately result in reduction of water pollution and lastly the aquatic animal’s death to these problems will be reduced. It consists of Belt drive mechanism which lifts the debris from the water. The use of this project will be made in rivers, ponds, lakes and other water bodies for to clean the surface water debris from bodies. Similarly they are lots of problems of water pollution under Godavari River, Nasik which affect the acoustic, human life & beauty of Godavari River. The some photo graphs are shows the water pollution near Godavari River Nasik. Waste water is defined as the flow of used water from homes, business industries, commercial activities and institutions which are subjected to the treatment plants by a carefully designed and engineered network of pipes. The biggest impact of cleaning the chemical wastes can cause respiratory diseases and it plays a challenging issue for the municipality officers Water damage is classified as three types of contaminated water. They are clean water, gray water and black water. Clean water is from a broken water supply line or leaking faucet. If not treated quickly, this water can turn into black water or gray water, depending on length of time, temperature, and contact with surrounding contaminants. A drainage ditch is a narrow channel that is dug at the side of a road or field to carry away the water. Nowadays, even though automation plays a vital role in all industrial applications in the proper disposal of sewages from industries and sewage cleaning is still a challenging task. Drainage pipes are used for the disposal of sewage and unfortunately sometimes there may be loss of human life while cleaning the blockages in the drainage pipes. The municipality workers are only responsible to ensure that the sewage is clean or not. Though they clean the ditches at the side of buildings, they can’t clean in very wide sewages. The municipality workers need to get down into the sewage sludge to clean the wide sewage. It affects their health badly and also causes skin allergies. The project consists of a motor operated water wheel to run the project. It has four DC Motor of 12V, 7.6 Ampere. The device which is running the project is chain drive coupled having collecting plate. The project consists of two main shafts balancing and hoisting the sprocket of chain drive. The components are rest on frame serve as main body of the project. The steel pipe with pressurize air generates pressure head to run the project on water surface. The fabricated storage tank is used to store the waste fulfilling the purpose of the project. In this project the main aim of this machine is to lift the waste debris from the water surface and dispose them in the tray. Here we are fabricating the remote operated river cleaning machine. The collecting plate and chain drives are rotating continuously by the motor. The collecting plate is coupled between the two chain drives for collect the waste materials from river. The collected wastages are thrown on the collecting tray with the help of conveyer. Our project is having propeller which is used to drive the machine on the river. The propeller is run with the help of two PMDC motor. The total electrical device is controlled by RF transmitter and receiver which use to control the machine remotely. 1) It is a non-conventional river cleaning system. 2) It’s initial & maintenance cost is low. 3) Skill Worker not required to drive the system. 1) It is applicable to reduce water pollution in rivers & ponds. 2) It is useful to remove the sediments present in swimming pool to keep it clean. Sir plz provide me more information and specifications of motors and battery and where this components are available i want to make my project.